Aldous Huxley (1894 - 1963) was an English writer and philosopher. He was best known for his novels "Brave New World" and "The Doors of Perception." Earlier in his career Huxley edited the Oxford Poetry magazine, wrote travel articles, film stories, and scripts. He later became interested in spiritual subjects such as parapsychology and philosophical mysticism, including universalism. He was nominated for the Nobel Prize in Literature in seven different years. 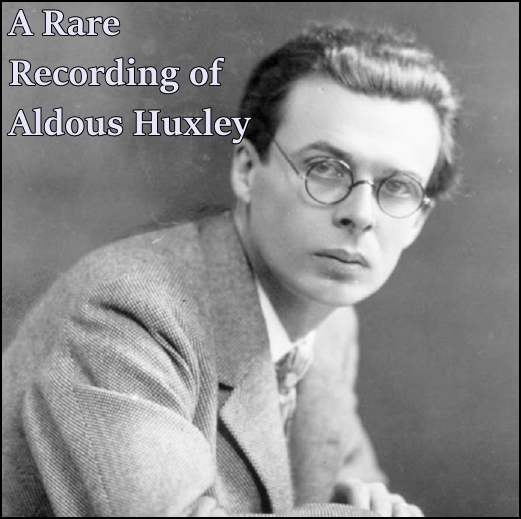 This recording is part of a speech in which he discusses "Brave New World" and George Orwell's "Animal Farm." Aldous Huxley (1894 - 1963) was an English writer and philosopher. He was best known for his novels "Brave New World" and "The Doors of Perception." Earlier in his career Huxley edited the Oxford Poetry magazine, wrote travel articles, film stories, and scripts. He later became interested in spiritual subjects such as parapsychology and philosophical mysticism, including universalism. He was nominated for the Nobel Prize in Literature in seven different years.